ASTC formula is nothing but "all sin tan cos" rule in trigonometry. The "all sin tan cos" rule can be remembered easily using the following phrases. ASTC formla has been explained clearly in the figure given below. In the first quadrant (0° to 90°), all trigonometric ratios are positive. In the second quadrant (90° to 180°), sin and csc are positive and other trigonometric ratios are negative. 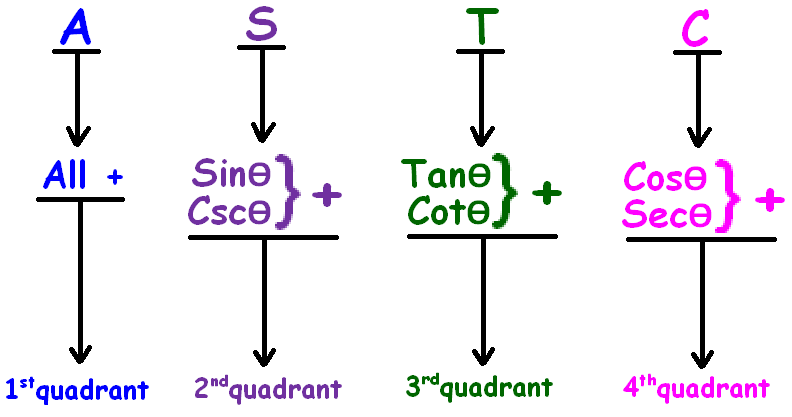 In the third quadrant (180° to 270°), tan and cot are positive and other trigonometric ratios are negative. 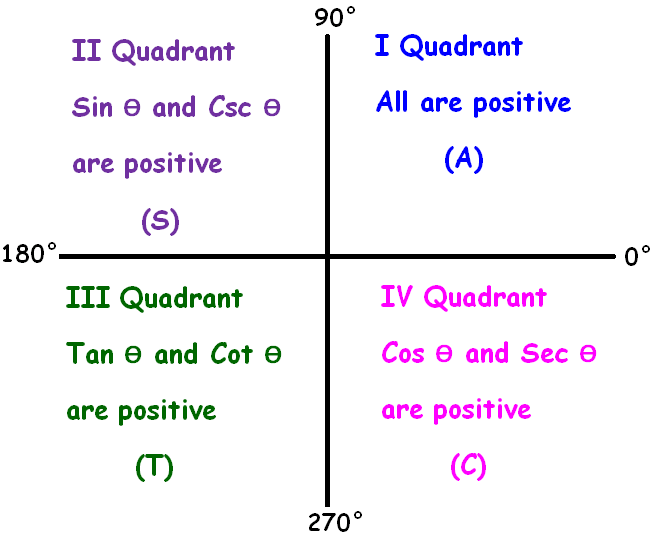 In the fourth quadrant (270° to 360°), cos and sec are positive and other trigonometric ratios are negative. For the angles 0° or 360° and 180°, we should not make the above conversions. Let us see, how to use ASTC formula. To evaluate cos (270° - θ), we have to consider the following important points. (i) (270° - θ) will fall in the III rd quadrant. (ii) When we have 270°, "cos" will become "sin"
(iii) In the III rd quadrant, the sign of "cos" is negative. To evaluate sin (180° + θ), we have to consider the following important points. (i) (180° + θ) will fall in the III rd quadrant. (iii) In the III rd quadrant, the sign of "sin" is negative. Based on the above two examples, we can evaluate the following trigonometric ratios. If the angle is equal to or greater than 360°, we have to divide the given angle by 360 and take the remainder. (i) Let us consider the angle 450°. When we divide 450° by 360, we get the remainder 90°. When we divide 360° by 360, we get the remainder 0°. The given 735° is greater than 360°. So, we have to divide 735° by 360 and take the remainder. When 735° is divided by 360, the remainder is 15°. Let us look at the next problem on "ASTC formula"
Since the given angle (-870°) has negative sign, we have to assume it falls in the fourth quadrant. In the fourth quadrant, "cos" is positive. So, we have cos (-870°) = cos 870°. The given 870° is greater than 360°. So, we have to divide 870° by 360 and take the remainder. When 870° is divided by 360, the remainder is 150°. Hence, cos 870° is equal to - √3 / 2 . Let us find the value of each trigonometric ratio for the given angle. Hence, the value of the given trigonometric expression is equal to 1/2. Hence, the simplification of the given trigonometric expression is equal to 1. Hence, the simplification of the given trigonometric expression is equal to 0. After having gone through the stuff given above, we hope that the students would have understood "ASTC formula"
Apart from ASTC formula, if you need any other stuff in math, please use our google custom search here.